This website, Micronautical.com rarely features kayak reviews because it is about kayak and small boat design, and it discusses closely related subjects such as outfitting. The idea behind Micronautics is that very small boats (e.g. 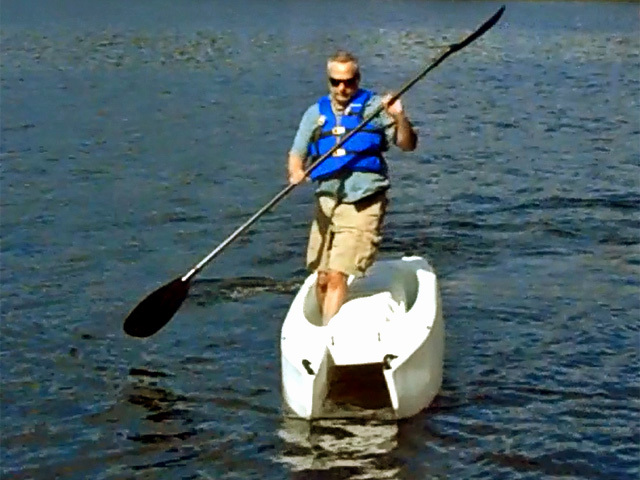 kayaks) are so different from bigger ones that their design requires a totally different approach and science. 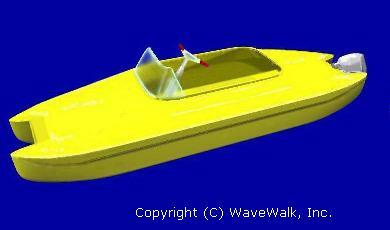 These things are not merely theoretical, but they are developed by Wavewalk and successfully implemented in its kayaks and portable boats. Why am I writing a review of a boat that I created?.. The answer has two parts – The first is that many months ago, before we launched this product, I had promised some Wavewalk fans that I’d write such a personal and professional review on this new boat. The second reason is that now that the initial phase of launching this product is winding down, and it got such positive and exciting reviews from clients and fans, I also feel like talking about it from a personal angle and a professional one, but this time more as a designer than a marketer. Where did the W700 come from? However, the W300’s main application was kayaking, namely paddling with a dual-blade paddle, so we gradually started calling it W-kayak, and as anglers discovered it shortly after, it became known as a Wavewalk fishing kayak. The boat’s main commercial application had defined it. In 2009, when we launched the W500 series, it was primarily a fishing kayak, and we knew that more anglers would motorize it, which indeed happened. Around 2011, following Sungjin Kim’s successful outfitting of a W500 with a 2HP Honda outboard motor, we became seriously involved in developing the motorized application for our kayaks… We developed transom motor mounts, spray shields and inflatable flotation modules to go with them, and we tested and demonstrated their performance, both with one person on board (I.E. the driver), and with an additional, lightweight passenger. People became increasingly interested in this concept, and at the same time, we became aware of its shortcomings , mainly the limited load capacity and limited stability offered by this 29 inch wide design. Early in 2014, Kenny Tracy, a.k.a. ‘One-Shot’, outfitted his W500 with home-made Styrofoam side flotation and a 6 HP Tohatsu outboard, and soon after drove this boat at 13 mph, at 1/3 throttle, thus shattering the previous speed record for it, which was just under 10 mph… What first seemed like a crazy idea of a motorcyclist who likes to tinker with boats turned out to be a pivotal event. Kenny’s breakthrough acted as a catalyst that led us to developing the large-size inflatable flotation tubes that together with the Spray Shield served to create the W570 model, which is the intermediate concept between the 500 and 700 series. We realized that if we wanted to offer a motorized watercraft that can take two full-size American anglers with their fishing gear, as well as go at high speed in choppy water, we’d need to come up with an altogether new product, I.E. 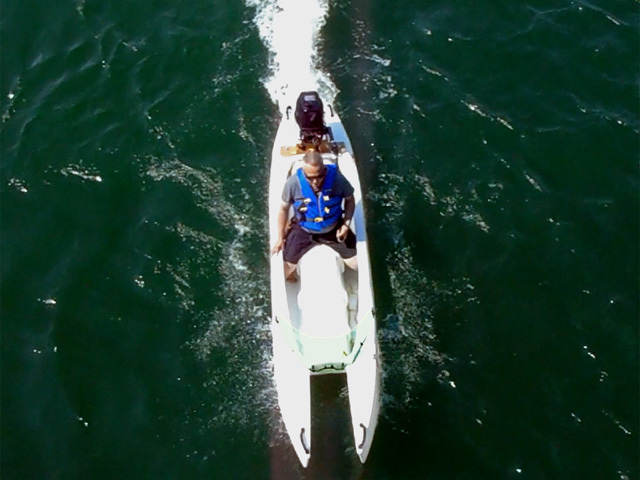 a boat that would be bigger and more stable than the W500, but lightweight enough for one person to car-top, and narrow enough for paddlers to paddle easily, effectively, and comfortably. This was the beginning of process known as Design Spiral, which is typical to the way new products come into being. The main reason why this process took a long time, and as a result we missed the main part of the 2015 season… was the fact that if we simply enlarged the W500 design, there would have been no rotational molding machine capable of effectively producing it. So we spent a long time and much efforts looking into other molding technologies and other materials, only to realize that Polyethylene (PE) was the best material as far as resilience and durability are concerned, as well as price, and we wanted to have a product that offers the most with regards to all these parameters. The bigger size of the W700 and the need to create industrial tooling that consists of two cast aluminum molds instead of a single one practically doubled our investment, compared to what we had paid in 2009 for the W500 tooling. In the period that preceded the creation of the computer aided design (CAD) files for the W700 molds, I had many interactions with clients and dealers who were interested in this project. Among them were Michael Chesloff and Steve Lucas, to name a few. These people provided their ‘wish lists’, and voiced both their concerns and recommendations. It became clear to me that unless the new product is not just better than the W500, but a true breakthrough in boating and fishing, it might not justify itself. And by justify I mean commercially, in dollar terms, with an investment of nearly $80,000 in the tooling, including adaptations performed at the rotational molding plant after the molds got there, and not including the long hours that we spent on creating the CAD files for it. The main reason why SOT and Sit-In fishing kayaks are so sluggish is their excessive width, which generates so much residual resistance (Rr), also known as form resistance from the water they travel in. This wouldn’t have been an issue with the W700, since it is a true twin-hull (catamaran) featuring a pair of very narrow hulls. However, the extreme width of those other fishing kayaks (some exceed 40 inches…) works to make them sluggish also by preventing their users from moving their paddles effectively. As for motorboats, even the smallest ones are stabler than kayaks, because they are much wider, but you can’t paddle a boat, practically speaking. We wanted the W700 to be a great paddle craft even for one paddler going in rough water, which meant keeping this boat slim, but we also wanted it to be a great motorboat even at high speed (for its size), which meant that we had to increase its width in order to make it more stable than the smaller, 29″ wide W500. The overwhelming majority of anglers who go on water don’t fish from kayaks – They fish out of motorboats. And while most of these craft are designed to take more than two large size fisherman on board, it is quite rare to see a boat manned by a crew of more than two. In fact, the typical crew of a recreational fishing boat is two. So the W700 was required to take two large size American guys on board, plus their fishing gear, an outboard motor, and the fish caught…. Adding up all these things and their aggregated weight gave us the volume (number of cubic inches of buoyancy) that the W700 had to have, and since the boat’s width had already been decided, as well as the saddle’s width that was known after a decade of successful use in the W300 and W500 series, it was the aggregated load requirement that decided the boat’s total length from end to end. We knew that the W700 would be much stabler than the W500, so we used the opportunity to make its saddle a bit higher, for the benefit of passengers with long legs, arthritis, neurological problems, and for those who had joint replacement surgery or suffer from other disabilities in their legs. Here again, the answer came from experience and common sense, with some simple calculations – We knew that a heavy driver might prefer to sit next to the transom while they operate a motor weighing 30 lbs to 60 lbs, and in any case, they’d be sitting next to the motor when they start it. This meant that we had to make the stern buoyant enough to support the weight of both driver and motor, and since the width of the boat was already given, we had to provide this extra buoyancy at the stern by placing the motor mount and the motor attached to it away from the rear tips of the hulls. 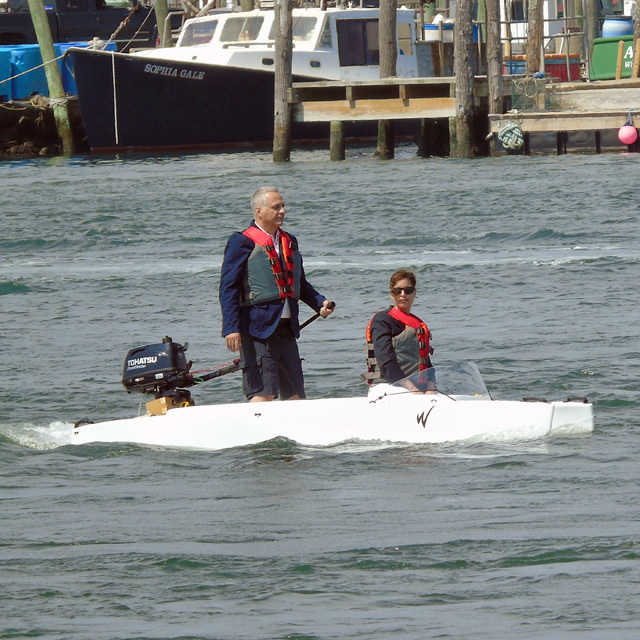 We set the distance based on the tests we had run on the W570 outfitted with the 60 lbs 6 HP Tohatsu outboard. As for the cockpit front, we knew from previous experience driving the W570 in choppy water that bumping into waves at high speed can generate much spray, so we’d better keep the front end of the cockpit at a reasonable distance from the hull tips. In this sense, the actual length of the W700 cockpit, which is 7’10” reflects what’s left after we applied these requirements. Another thing we had noticed while driving the W500 and W570 was that the motor being closer to the driver helps the driver start it, manipulate its controls, and drive the boat while being seated or standing in the middle of the cockpit. For these reasons we designed the ends of the W700 cockpit’s spray deflector as straight lines and not curved ones, thus allowing for the closest possible distance between motor and driver. And if the reader asks themselves why we designed the front end of the cockpit in the same way, the answer is that following our clients’ insight we thought that some anglers would want to attach a powerful outboard gas engine in the back of their W700, so that they could cover the distance to their favorite fishery in the shortest time, and use a small electric trolling motor attached to the front once they arrive there and start fishing. In other words, we planned for a scenario typical to what anglers commonly do when they fish out of popular boats such as Jon boats and bass boats. This is to say that among various other considerations, we created the W700 as an alternative to these popular boats. Another reason why we got a 6 hp motor that’s overkill by a considerable margin is that many boat owners overpower their boats just because they can, and we wanted to know what this involves. Some people asked me how come we engaged in such a project without first creating a prototype for this new boat. This question is well placed, naturally. Making a full-size W700 prototype was possible only if we did it in fiberglass or carbon fiber, and it would have cost tens of thousands of dollars, and take many months to complete. Realistically, such a fiberglass or carbon-fiber reinforced resin W700 prototype would have not told us anything interesting about the same boat made from Polyethylene. We finished the work on the CAD files for the W700, and sent them to the mold makers, who used them the create ‘patterns’, a.k.a. ‘plugs’, which in their turn served to create ‘sand’ molds into which the mold makers cast the molten aluminum. Once the aluminum molds were cast, the mold makers outfitted them with steel frames that would be used to attach them to the rotational molding machines, and polished them. The last phase of mold making was coating the inside with Teflon. Coating molds is required in order to make it easier for the rotational molders to extract the Polyethylene ‘parts’ from the molds. Making a cast aluminum rotational mold of this size is a lengthy and complex process that’s prone to delays, which was the case with the W700 project, and only in the second part of August were we able to start shipping the first W700 units to clients and dealers who had ordered them weeks and months before. Some people who found it easy to car top their W500 worried that car topping the heavier W700 would be significantly harder for them. I had car topped a W500 with a 2 hp Honda outboard attached to, so I wasn’t worried about it, and indeed, one of these clients who had gotten his W700 a few days before I did, reported that car topping it was a breeze. It was indeed. Our first test took place on lake Massapoag, on a sunny but windy day in late August. We didn’t take a motor with us since we knew that we’d have no time to test the boat with a motor on that day. In the days before I received my W700 I had already gotten very positive comments from a couple of clients who had theirs delivered to them before I did, so there was little anxiety on my part in that first time I tested this boat in real life. Besides, I had tested it so many times in ‘thought experiments’ that I pretty much knew what to expect, kind of, although real life experience is different, being based on sensory input and not on technical knowledge aided by a trained imagination. I entered the white W700 cockpit from a dock and started paddling standing, and I was impressed by the new level of stability that I was experiencing, although I wasn’t really surprised, because this had been my main concern and therefore my focal point… but then, after a few more paddle strokes I had my first pleasant sensory surprise: This boat was fast! It glided like a champ, and tracked like a dream… -“Wow!” I thought to myself, “What a nice bonus!”. I had expected the W700 to be faster than the W500, but imagining speed in paddling is probably harder than imagining stability. The next thing I tested was ease of turning, and here too I had a delightful moment, as I realized that the boat was easy to turn – “The smaller draft helps!” I thought to myself. I paddled back to the dock, on which my wife was standing with a video camera. I had planned to demonstrate the boat’s stability the way I did back in 2010, when we shot the ‘Super Stability’ movie with the W500… So I faced the dock, and started jumping up and down and from one foot to another, trying to generate a lot of spray in the process, as I had done with the W500… but the W700 didn’t cooperate – It hardly budged. A 200 lbs guy jumping in it and trying to get it to sink in the water and pop out wasn’t enough. It didn’t work even as I jumped energetically from side to side. Later, I thought about this test and realized that it proves ‘boat stability‘, namely a degree of stability that kayaks cannot offer, since they allow the user to sit or stand along their center line, but not to stand on one side of their deck, or hull. This is something that only a good size boat can offer, and the W700. Next came a series of tests that showed how easy it is for the user to turn inside the cockpit. This is of particular importance due to the advantage of starting the outboard motor while facing it (I.E. facing backward), and then, once it’s on, turning and facing forward. Later, in other occasions, we showed how this works perfectly when the boat is motorized. In principle, this is possible with a W570 too, but it’s not as easy as it is in the W700. After we ended that video shooting session, I took my wife for a tandem ride in the boat. She sat in the front, without paddling, and I stood at the rear and paddled. This time I had a double surprise – The first was that the boat glided very nicely on the choppy water without me putting much effort in paddling, although I had to move an additional 135 lbs… “It’s the effect of the bigger load capacity!” I thought to myself. Then, after a couple more minutes of paddling this way, I noticed that I wasn’t paying any attention to stability… It was like the issue of stability had been erased from the agenda – Stability had become a non-issue, and I was no longer required to address it. “Nice!” I thought to myself -“This boat is instability-free”. Michael Chesloff called this boat “ridiculously stable”, and I like this expression because it captures the feeling of incredulity mixed with relief that one feels when they first paddle it. We weren’t going to test the W700 with a 2 hp outboard because doing it with such a small outboard would have been ridiculous, so we ran the first test with our 6 hp Tohatsu outboard, which can propel boats weighing up to 3,000 lbs, according to its owner’s manual. 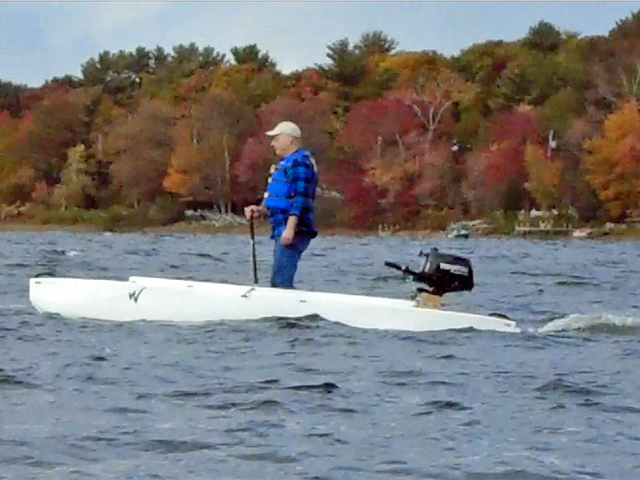 The W700 weighs 80 lbs… the motor and transom mount weigh a little over 60 lbs, and I weighed about 210 lbs at that time. That’s a total of 350 lbs. These numbers should tell the reader by how much the W700 we tested was overpowered. The spot we picked for testing the W700 and shooting our demo video was Westport Point, in Massachusetts’ South Shore, and if the water surface there looks interesting in video it’s thanks to fast and sinuous tidal currents and big wakes generated by motorboats going in all directions. The team consisted of two camera persons – namely my wife and my younger son, and me in a dual role of test driver and director. Later, my wife joined me in the boat. She first sat in the front of the cockpit facing forward, and while I was driving, she turned around and sat facing backward. She did it effortlessly, and I didn’t have to make a particular effort to balance the boat while she was turning. The boat behaved very well – It was stable both in terms of lateral stability and directional stability (tracking), easy to maneuver, dry, and simply a pleasure to use both solo and in tandem, seated and standing. Starting the motor while facing backward was easy, and turning in the cockpit in order to drive facing forward was easy too. I steered using the same articulated (U-jointed) tiller extension that I had used before with the W500 and W570, and it worked very well. My only concern was that with a 6 hp motor the throttle never passed the 1/2 mark, even when the boat was going fast… This meant that somewhere in the back of my mind I had to pay attention to the throttle, because with so much extra power available in the engine, a wrong twist of my wrist could have made me lose some control over the boat, and such glitches are unwanted by definition. The new saddle design performed exactly as we had intended it to. The combined effect of the multiple molded-in brackets along the saddle’s length and the wooden bracket at its rear end provided the feeling of sturdiness and comfort that I wanted to achieve when we worked on this new design. Being 6 ft tall, I felt more comfortable sitting a little higher than in the W500. Wow! It felt great, and we knew we had a winner. The two movies we shot at Westport Point showed the W700 as a fishing boat and a utility boat (tender), as well as small touring boat, and it looked good in all these applications. But I wanted to take it further – I wanted to eliminate my concern about this boat being overpowered, and turn steering it into a pleasure by itself – a means to have fun. Silly question? Maybe. After all, what matters is how people see this boat and use it, and not words put together by its inventor-designer-manufacturer-marketer. 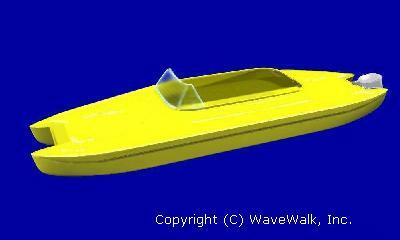 However, better definitions could help people better understand this new type of watercraft. Although the W700 bears similarities with the W500 as well as with other types of watercraft, it is unique in more than one sense. 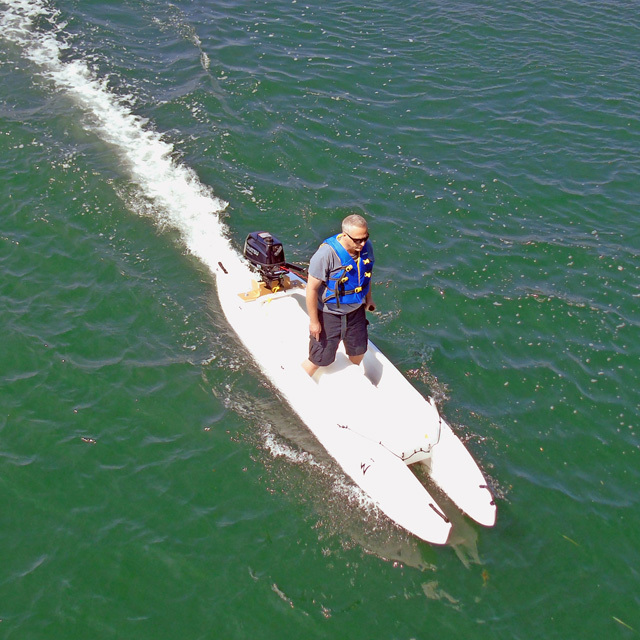 Moreover, better definitions can help us, at Wavewalk, find more markets for it, and improve the user experience of people who paddle it, drive it, and fish from it. The bottom line is that the W700 is an exciting watercraft with an exciting future!